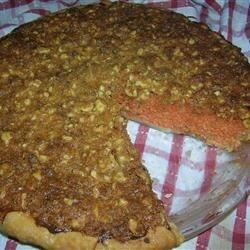 "Carrot custard filling topped by crunchy pecan streusel--unusual and delicious!" This was YUMMY!!!!! So good!!! Definitely a keeper. Instead of pumpkin pie spice I added 1 tsp. cinnamon, 1/2 tsp. each of nutmeg and giner, and 1/4 tsp. cloves. DELICIOUS!!!! Very good, with or with out the nuts on top. The bomb. Did not put the topping on, still beats pumpkin pie, nice texture.